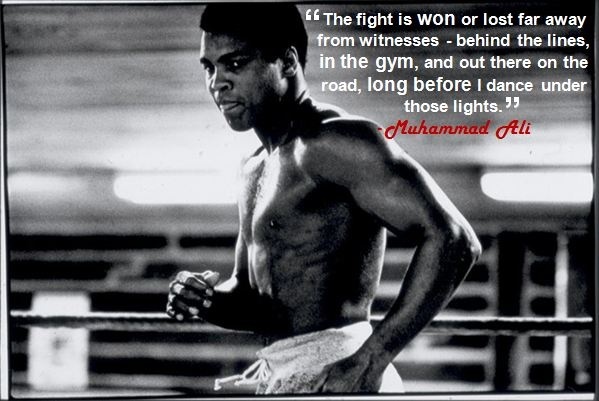 Somewhere between the eulogies, the obituaries, the tweets, the memes and the acres of press coverage on the passing of Muhammad Ali… lies a set of transformative lessons. Lessons that took a young African American Cassius Clay from Louisville, Kentucky to becoming Muhammad Ali – heavyweight champion and one of the most recognisable and loved figures on the planet. 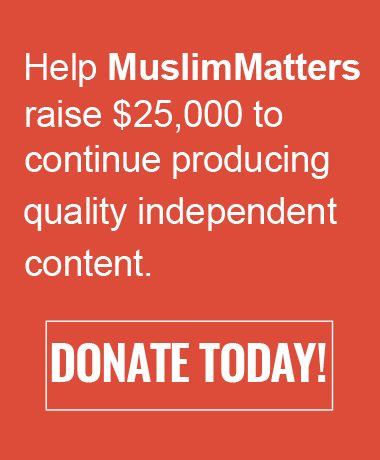 Lessons that a Muslim world in turmoil is desperately in need of. Muhammad Ali knew exactly what he wanted to achieve from an early age. His school friends recall him sparring with them as a scrawny kid and telling them he was going to be Heavyweight Champion of the world. Even though it looked like an impossible dream then, he had already taken the first step toward his goal just by having one in the first place. Without a vision, there can be no hope of achieving our dreams. Instead we wander the wilderness, forever reacting instead of acting. The Muslim world is desperately in need of a positive vision to aim for, to marshal our abilities towards and to inspire us. Everyone knows that it takes hard work to become world champion. But to become world champion 3 times over and after a prolonged enforced break at the height of your physical abilities? That’s when you know that Muhammad Ali had an exceptional work ethic. He put the hours in, he used to train wearing extra layers of clothes and weights tied to his legs. He went to the limits of his physical abilities… and then kept going. 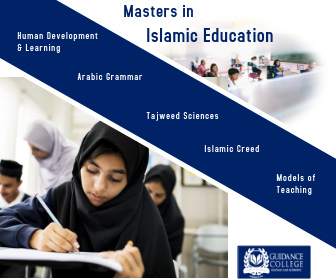 The Muslim world used to be the nation that revelled in working hard. We would put the hours in to make new discoveries, build the most magnificent structures and uplift the human race. Today, we are amongst the least productive people on Earth. We need to regain our love of sweating for our supper. There have been many exceptional individuals in the past century, but few have been so keen to share the secrets of what made them great with the rest of us. Muhammad Ali was transparent and open to constantly sharing words of inspiration and motivation to anyone and everyone. The Muslim world suffers from a crisis of communication. We are unable to articulate ourselves and our faith to each other and to the rest of the world in terms that even begin to show the beauty of Islam and the wisdom behind it. We need to regain that eloquence, the magic and the words to inspire once more. 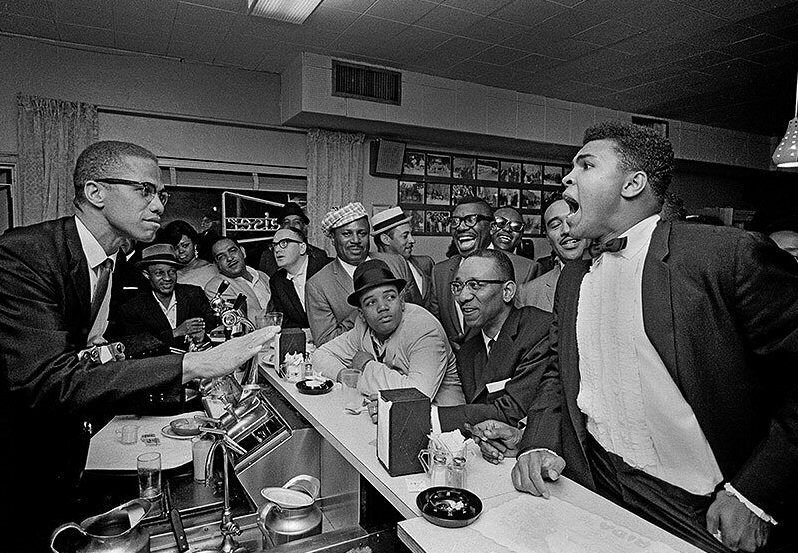 There are few figures more iconic, more quotable and more consequential in the past century than Muhammad Ali, but his mentor Malcolm X was one of them. In the early years of their friendship, Malcolm was like an older brother to Muhammad Ali. But then Malcolm broke with the Nation of Islam and Ali ostracised Malcolm as the leadership of the Nation demanded. One day, they passed by each other outside a hotel in Ghana. Malcolm tried to say salaam to his old friend, but Ali ignored him. Years later, when Ali also joined traditional Islam and Malcolm had been assassinated – Ali regretted this incident deeply. Muhammad Ali was big enough to admit his mistakes publicly. There are many areas in which we are on the receiving end of injustice and oppression, but the Muslim world needs to be open and honest with itself about our own failings and how we have fallen from our better selves. When he changed his name from Cassius Clay to Muhammad Ali, there were many who refused to use the new foreign sounding Islamic moniker for him. Muhammad refused to given in to their prejudice just to fit in. There was a boxer who point blank refused to call him Muhammad Ali. When they finally got in the ring, Ali rained blow after blow on him each time bellowing “What’s my name?” until his prejudiced opponent gave in. The respect he had for the name was seen once more when he was given his own star on the Hollywood walk of fame. He requested that his star not be placed on the floor like those of others, but instead fixed into a wall. When asked why he replied that he could not bear to have the name of the Prophet (SAW) on the ground where it could be walked over. This dignity and self-respect is something missing from many parts of the Muslim world today. He was unashamedly black, unapologetically Muslim, unimpeachably confident and yet unbelievably likeable – and in doing so, showed that we don’t need to compromise on our values in order to gain respect… or even love. 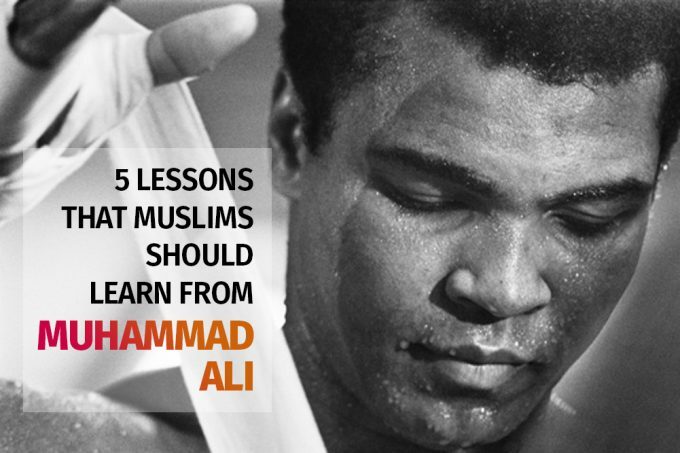 Muhammad Ali meant something special to everyone, but to Muslims he was an incredibly inspirational figure. You have to understand that for a once great civilization, Muslims have precious few public figures that represent the best of what we used to be and not where we are right now. All across the Muslim world, Ali stood out as an example of someone who was comfortable in his own skin and the world was comfortable with him too. To the world he was a boxer, a legend, a champion and even “the Greatest of All Time.” To Muslims he was something far more precious. He was one of us. Allahu Akbar! I felt emotional after reading this article. Jazaka’llahu kairan! I have tears in my eyes after finishing reading it. I trully agree its inspirational and heart touching reading this. May Allah SWT grant Him Jannah and forgive Him All His Sins . Yeah an irreparable loss to not only d world but to all muslims.May Allah grant him jannah. Innalillahi wa inna ilaihi rojiun. Selamat jalan Muhammad Ali, semoga Allah menghadiahimu surga. This was truly inspiring! May Allah forgive him and grant him the highest place in jannah, near to the one whose name he proudly proclaimed and respected. Great article. He was truly a role model for the modern Muslims. Muslims are doing it so already. Alas, we should have learnt all this while he was alive. I think, there might me many more such greay people around we should know the details, so we can copy the traits. 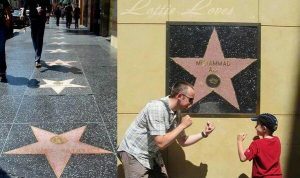 Can we have more about Mohammad Ali’ s recent achievements? Muhammad Ali easily moved from the Nation of Islam, to Sunni Islam, to Sufi Islam in 2005. In this day of Islamic sectarianism, the absence of negative comments by him about past religious experiences is commendable. Many people do not know this, but he was greatly influenced by the peaceful writings of Hazrat Inayat Khan, “Founder of the Sufi Order in the West”. There are interviews from a week or so ago with his daughter when it became apparent that Ali was dying. She reveals much about his religious influence in his life as well as in hers. This article has brought tears to my eyes, purely out of a mixture of reverence for its beauty and shame for the state we are in. May Allah guide us all – Ameen ! Sincère condolences to Muhammed Ali’s family. May Allah grant him forgiveness and peace! I admired him since 1970. MAY ALLAH BLESS MOHAMMAD ALI. Innalillahiwainnailaihirojiun. The world will miss him very much. He is and will always be an inspiration to us all. May Allah pardon all his sins, grant him mercy and place him in the highest Jannah. Ameen. Inna lillahi wa inna ilaihi rajioon. This article is so emotionally inspiring because it speaks the truth, about Ali about Islam about Muslims and us as people. Beautifully said for a great legend a wonderful soul. So proud that He was one of us. May Allah showers His blessings on Muhammad Ali’s soul. Amiiiiin. Masha Allah, what a beautifully written article. A tribute to a worthy Muslim espousing all the values which should be dear to all Muslims. 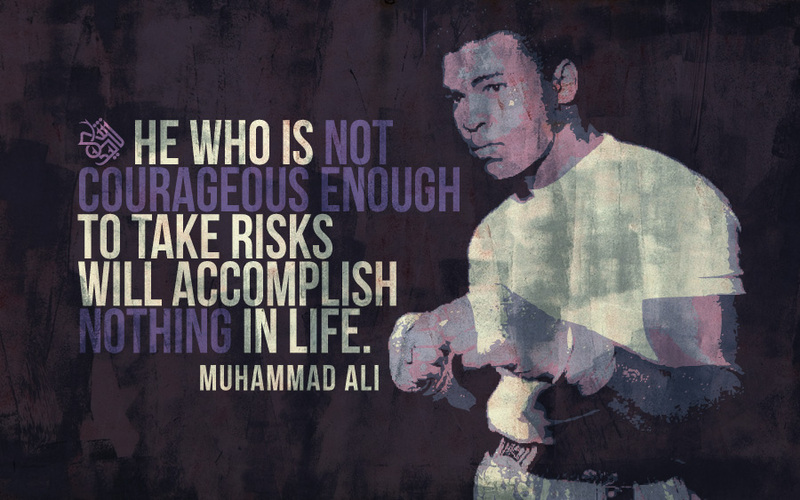 We have so much to learn from Muhammed Ali. The tragedy is that it took his return to the Creator for us to appreciate his qualities. From HIM to we come and to HIM is our return. Innal lahi. 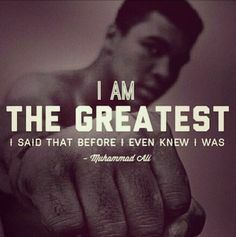 Quote; “when he was once asked about his debilitating Parkinsons, he replied “Perhaps it is Gods way of showing me He is the greatest… not me.” Allahu Akbar! JazakumAllah for this memorial article which truly give our brother Muhammed Ali the tribute he deserve. Rahmatu Allah. I watched the memorial service live on net from my home in Oslo,Norway; and it truly showed the legacy left for us as an ummah. It is to rise ourself above all racism and discrimination, to be a servant of Allah Azza Wa Jall between all religions or ethnicity. To view the tribute shown to Muhammed Alis(RahmatuLlah) memory by not only figurative muslims, but also christian and jewish leaders, buddhists and native indians….surely was the best memorial service ever and indeed justified to brother Muhammed Alis memory. I pray that his name in history not only inspire to courage, but also that our duty as a global muslim, is that our concern for the fellow human being is without border, no matter religion, status or beliefs. May he rest in peace, and may his family be blessed. Wish you all Ramadan Kareem. That’s fantastic may the Muslim world now take a look at words and phrases, and put in to practice, amin. Wa jazaakum Allah khairan. That’s fantastic may the Muslim world now take a look at this words and phrases, and put in to practice, amin. Wa jazaakum Allah khairan. I am learn more about Muhammed Ali in this article which is unknown for me before. May Allah blessing him and reach Jannatul Ferdous. Amiiiiin.